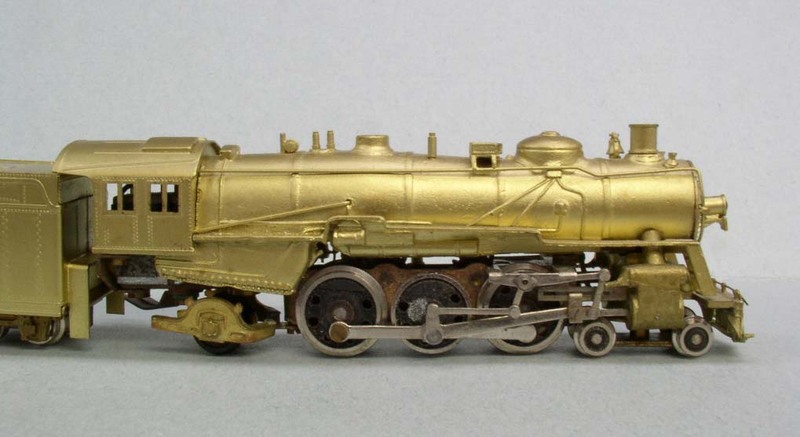 NTrak does not consider N scale steam "dead" by any means. Those books were very popular both with the NTrak organization folks and with their customers. Well, steam being dead was mentioned somewhere (in the Editorial?) in the latest NTRAK newsletter. I was going to quote that statement, but I lost (deleted?) the email with the link to the newsletter so I can't access it anymore. If someone PMs me the link to the PDF, I'll find that statement. I was quite surprised by it myself. As many of you know, Ed and I have both helped with the steam annuals for a few years doing layout design (Ed) and photo editing (me). Gathering authors, material, and then editing articles is a formidable job. There were always two people doing that job, but presently there are none and that's the only reason there has not been a new edition. 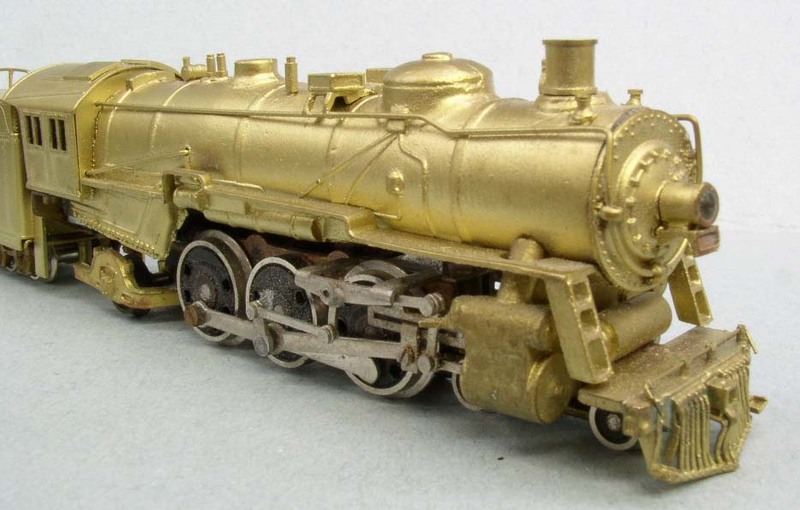 NTrak does not consider N scale steam "dead" by any means. Those books were very popular both with the NTrak organization folks and with their customers. And speaking of... We're actively looking for editors! If any of you would be interested in the job, please let Max and I know. I really missed doing the book last year. I'm actually even working on an article for the next one myself. Just to put a face on it . Jeepers, I would think that would have gone for much more than 65 bucks. Yikes! At 65 bucks, that would qualify as cost effective engine terminal scenery. Well, it arrived today. I can't exactly say it was misrepresented. The good news, I don't see anything here that's worse than I expected....I don't think....yet. The bad news, wow, there's a lot here. The most concerning is that the #2 and #3 axles are locked up and it 'looks like' the motor is knocked loose and the worm is binding into the worm gear. When you put it on the track, the #2 axle is 'down' so that it's teetering on it. My guess is that it was dropped and landed on the pilot. The pilot looks like it can be bent back up again, smokebox is loose but intact, a broken solder joint on the handrail, drawbar all bent. Symptomatic of a drop, but this thing has a cast boiler like a tank. So I documented it with photos before I begin to tear it apart, as it may never look this way again. There's some things on it that are kind of inexplicable and just lazy, like the tender. The oil bunker should sit inside the tender, not etched flush. The best news is that a lot of the things you'd need to really upgrade this appear to be available, once I can get past the chassis examination. There are now Shapeways parts to really take this up a notch, like the Hodges truck, ATSFNscalemodels has an outstanding 12K tender, on and on. I didn't get this to put it on a shelf, it's an insane rebuild, emphasis on insane. OK, disassembly will begin.... we'll see what happened inside. If I can just take the motor completely off, free up the gears, and get the chassis and running gear to roll smoothly, that's all I'm hoping for at this point. The overall proportions and dimensions check out pretty well against the clearance diagram published in "Iron Horses of the Santa Fe Trail", which is what got me here to begin with. Whatever I got to begin this project was getting rather dismembered, I considered several options but on most the beginning part was to grind everything off the boiler and start over, or scratch the boiler due to the dome placement and boiler taper. Update: Well, it's apart, the motor was jammed, and everything is kind of corroded, but after lubrication, the only real glitch I'm seeing are burs on the inside of the crosshead guide and the tolerances there. But it does move. I was surprised that the motor was actually a five-pole, rather incredible for the year it was made. randgust, I'm going to have to follow this one closely, I have one of these in a display case that ran for a while back in 1982 or so. It may be fun to see if I can get it running again. Wow, you're a braver man than I am Randy, hope the work, and there's a lot of it, is fun and pays off! Since you mention Worley, I'm sure you're aware these 3400's were built and rebuilt in several versions and I'm curious which one you choose to represent. It looks like maybe the Jamco has the larger driver size, with the main one being an upgrade? Never mind, I now see all three drivers are boxpok style. I've got a soft spot for steam anyway, and I've attempted to limit my 'big steam' to locomotives that are still running today so that I can have excursion services... so I'd already picked up 3751 in brass, I've got 1225 as well, but I was both engineer and fireman on that one several years ago when they did the training programs, so huge soft spot for that one. 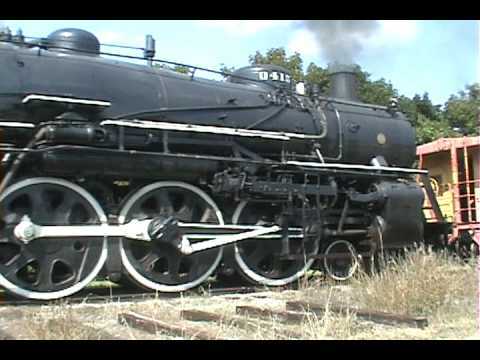 After the Abiline & Smoky Valley got the 3415 running again, it just tugged at me as I've always loved a well-proportioned Pacific. When I was just a little kid, I had a Tyco Pacific and hand-painted it up as 3441. I still have the darn thing. I hope to get to see 3415 someday. And it doesn't hurt that there's a ton of photos of it out there, from about every angle, to help with detailing. It was modernized, but still has that Hodges truck, 12K tender. Probably not perfect, but close enough for me. This thing is really sparse on detail, that's OK. But that's a ways down the road because I don't invest in that stuff until I can get it running. I managed to get a flywheel in the 3751, this has a big empty cast boiler, so we'll see. But the goal is 3415, just to state it for the record. The hard way. Still an important part of N scale history, particularly for its short run and other locos from Jamco, planned but never made. 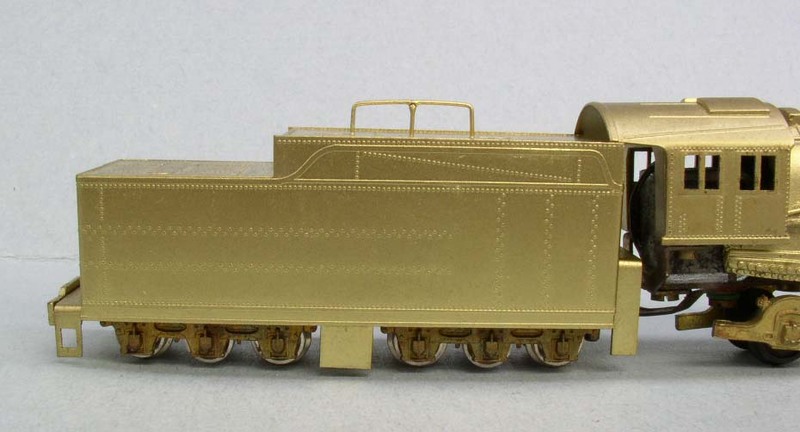 As an aside, I have always thought it a bit ironic that brass locomotive builders go through the trouble of making them out of brass and then, painting them gold instead of polishing the brass up and coating them with clear coat. They could just as well be made of lead, wood, or (shudder) plastic. And, I know About the weight factor. My first piece of brass was a jamco in 2006 after I started at the railroad as a 21 year old with money to spend!!!!!!!!!! I proceeded to tear it apart to use the boiler for other santa fe steam as I couldn't get it to run. I also found that everything seems a but big for n-scale, or that's what it looked like to me. The overall dimensions for the model appear pretty good, but the detail is best described as 'coarse'. We'll deal with some of these issues after I'm sure I can get past the running gear and frame issues, it progressed from 'jammed solid' even after the motor was pulled to ' rolls with a hitch' in about 30 minutes of work, I decided to quit while I was ahead. Other than the one yet undetected hitch it's rather smooth, so there is hope here. I would have preferred to totally drop the rods and start from drivers and gears and work up, but the main rod and eccentric are soldered on the crankpin. It 'might' back off, or might not, but we'll see if I can get it to work OK without more disassembly. The lead driver runs free (no crankpins) and all drivers are geared, so you can get conflicts between the side rods and geared wheels if anything is misaligned. Frankly, in N scale steam, I've had no confidence in rods-only drivers, as they are difficult at best to quarter and wear out crankpins like crazy. Watching it from underneath there's an abundance of tolerance issues to work with here and some rubbing rods, etc. I am pretty sure I'm going to have to do something with the frame alignment as that center driver is running high, but I don't know if that's from a bent frame or needs tweaked with shims and filing. The 3400's were the probably biggest class of heavy Pacifics on ATSF, and they make the 1200 class look light by comparison. And this is a hefty model, if makes most current plastic stuff look like it's made of Styrofoam. As I'm a tractive effort worshiper, and I don't care for traction tires, that's a plus. I've got a plan here, and I'll reveal it as I make progress on it, if it doesn't hit a brick wall in the meantime with an issue I can't solve. If I were a collector, I'd feel obligated to restore it, as a runner and rebuilder, no such sympathy, particularly for one with one foot in the grave anyway. Well, I certainly discovered a design glitch in these I was NOT aware of. The crosshead is a separate piece, riveted to the main rod, and separately (??) to the piston rod. It rattles around on the crosshead guide, and under magnification, the crosshead guide is actually worn. My first experiments on finding the bind discovered that the crosshead is actually sticking in the crosshead guide as it's trying to twist under horizontal load. Touch it with tweezers and it breaks free. On the RH side, the guide is totally misaligned and worn, LH side isn't as bad. 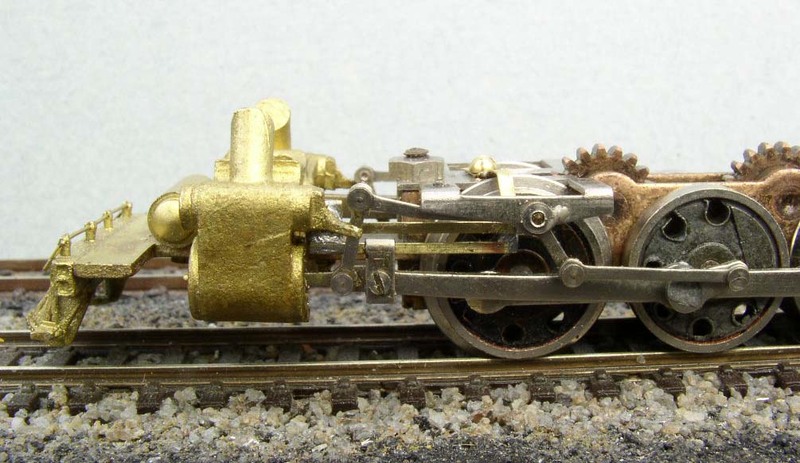 Now if you look at almost any other N scale steam I've ever seen, the piston rod and crosshead are one piece, either stamped or nylon cast, and that twisting under horizontal load can't possibly happen. The piston keeps it aligned so it doesn't wear the crosshead guide or get hung. The rest of the rods and rivets, etc don't seem that bad but that whole cylinder/crosshead/crosshead guide thing is just a really bad design. If it weren't so misaligned I'd be tempted to permanently fix the piston rod to the crosshead, but I've got to straighten out the crosshead guide to do that. I'm also tempted to look around in my N scale junkyard to see if maybe the thing to do is replace the entire crosshead/piston rod assembly with something else here. I have to remind myself that this was the era when Rapido just threw the main rod into the cylinder on the 0-6-0 and called it 'done', so this is a design I'm not sure was ever repeated. Suggestions? I've got a scrap Atlas 4-6-2 as a donor (it has dual crosshead guides though) and a leftover set of Bachmann 4-8-4 rods and guides that even have the ATSF-style ladder on the sides, so doing a crosshead/guide/piston replacement isn't out of the question. The main rod is held on with a screw to the crosshead so its possible to get that apart. I think I'm dropping the main rod off the crosshead to at least verify that THAT whole deal is where the mechanism is sticking and not something else. Update: Well, I finally proved it to myself, the hitch is definitely that the crosshead is 'rotating' in the slot of the crosshead guide and jamming. It's worn, and the edges of the crosshead jam in the slot. If you hold it perfectly straight with tweezers and rotate the gears with your finger, no jamming. So, here's the choices I see: 1) figure out how to solder or attach the crosshead to the piston so it can't twist in the guide 2) investigate replacing the entire crosshead/crosshead guide/piston and maybe even the main rod with something else. My leftover parts from the Bachmann 4-8-4 are amazingly similar in dimensions, it might actually work...maybe, but that's pretty radical. I did confirm that the eccentric is soldered to a screw and ground off, I can literally back it out to drop the main rod. Looking at photos of the 3415 and comparing them to the 377X class of 4-8-4's that Bachmann's is supposed to be, the crosshead guides, crosshead and main rods look almost identical. The neat part is that ladder going up the crosshead guide, Bachmann did that well. The plastic piston rod and crosshead are one piece and glide easily, and Bachmann 'faked' out the crosshead guide by using the bottom brace like a dual guide, although both the 4-6-2 and 4-8-4 had the same top-only crosshead design. That's really tempting, because figuring out how to put the bottom brace and access ladder on the 3400 was another issue, it's pretty obvious missing detail. And the key here for the main rod length and piston throw has nothing to do with the driver size, it's the distance between the driver center and the crankpin on the rod on the wheel, and those check out. One of those ah-haaa moments, maybe. So plan A is try to fix, Plan B is radical surgery replacement. When I first took the motor off the frame, the entire chassis was frozen, wouldn't roll. When I did get it broken loose with lubrication, the hangs and binds were everywhere, isolated them to the rods banging into the crossheads and the crossheads hanging in the crosshead guides. I managed to solder up the crosshead to the piston rod on the right hand side, but the left hand side was much more defective than I imagined. I finally messed around with it to the point where it broke off. Worse than I thought. So again, against all conventional wisdom, I thought I'd take a shot at soldering up a brand new crosshead guide out of brass - brass bar material with a nice polished factory edge (.010x.030). I made new supports out of .010 brass and mounted the assembly with 00-90 screws on the frame so I could get the thing out and adjust it. Finally, I can actually roll this thing around by nudging it with a finger. No binds, no hiccups, silky smooth. Here's a closeup of that fabricated new crosshead guide. That's one of the toughest things I've ever made by hand. The best part is, that for no good reason, it no longer rocks on the center driver. No idea what happened, but I don't have to fix that now. Now, the gauge is tight, badly so, got to work on that, then start figuring out what I want to put on for a motor. Probably not going to use what came with it. Oh, and yes, when I can prove it runs, I plan to take down at least some of the flanges, this is deep-dish pizza even though my Peco C55 can take it. I have been tinkering with a seized MP pacific for a few weeks. Makes me want to pull out whats left of my hair. Glad to see you are making better headway than I. Do you plan on turning down the flanges and upgrading the details?